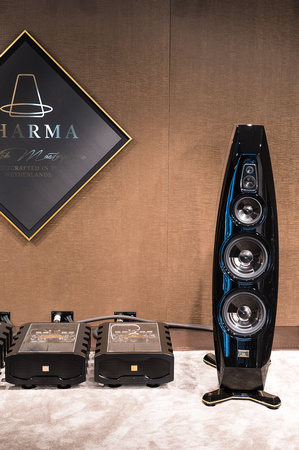 Cessaro showed its gigantic €400k Gamma 2 spherical horn system with F4-18 eighteen-inch field coil woofers driven by Cessaro electronics and sourced by TW Acoustic’s marvelous Black Knight record player. The system sounded absolutely superb on my Taj LP—completely neutral with no horn coloration, great transients, and sensational dynamic range. Quite realistic! The Cessaros lost a little image focus on Johnny Hartman’s voice, but retained the same immediacy and neutrality, sounding full and well-defined on standup bass, and rich and breathy on sax, with no excess brightness on piano and a superb top octave. Just a great room. 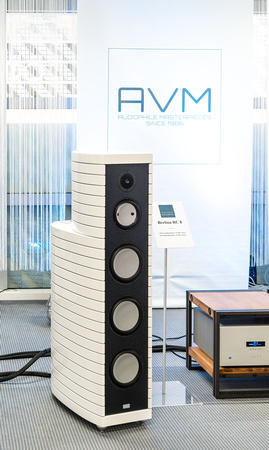 Holger Stein of Stein Music is best known (at least in the U.S.) for his remarkable room treatment systems, the Harmonizer and the Pi interface. 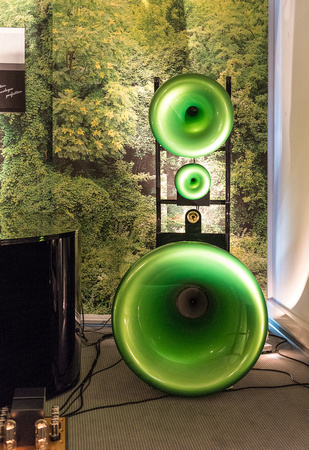 But the fact is Stein also designs and fabricates entire stereo systems, from loudspeakers through electronics—several of which were on display at the MOC. 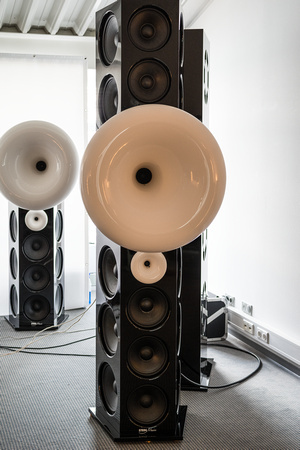 Though all of the Stein loudspeakers I heard were exceptional (coupled with Stein subs the little S5s were simply superb on Louis and Ella), the giant €200k Topline XL, a partially horn-loaded (in the midrange and treble), twenty-driver (!) behemoth with a separate column of subwoofers (comprising eight 18 inchers per side), produced a huge (though well focused), dark, beautiful, extremely deep-reaching sound with superb bass control. My Debussy LP was reproduced as realistically as I heard it in Munich, with extremely fine bowing detail, sweet dense tone color, very fast transients, some slight power range suckout on piano (which was corrected via DSP by the time I revisited the room on Day Three), and superb dynamics! A beautiful, majestic, highly musical presentation. 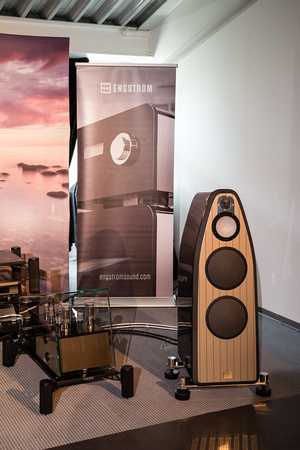 Charles Van Oosterum of Kharma was showing his €200k Enigma Veyron EV-4D, a five-driver (one 1” diamond tweeter, one 2” diamond mid/tweet, one 7” carbon-fiber midrange, and two 11” carbon-fiber woofers in a massive CNC-milled “bullet wood” enclosure), driven by a Kharma electronics, cabled by silver-and-carbon-fiber Kharma wire, and sourced by a top-line Clearaudio Statement turntable with Goldfinger Statement cartridge. The system sounded marvy on Louis and Ella’s "Isn’t It A Lovely Day"—a big, unusually rich presentation with very fine reproduction of texture and presence on both voices. As usual at the MOC there was a bit of boom in the bass, but no excess brightness. This was quite a gorgeous sound without a trace of the analytical—naturally fuller in timbre, I think, than past Kharmas (perhaps due to the EV-4D’s newly sourced and greatly improved carbon-fiber drivers). Crystal Cable demo’d its $22k two-way stand-mount Minissimo with $12k Subissimo woofer, driven by Crystal’s Cube amp and wired with Crystal’s new Ultimate Dream cable (which judging from what I heard is a must-review item). On a Johnny Cash number, the Minissimo/Subissimo offered up their usual superb presentation—rich in color, spacious in staging, high in resolution, and quite natural in presence, with superb bass even without the sub (the Ultimate Dream cable seemingly added an octave of low end to the Minissimo). A superior stereo system. 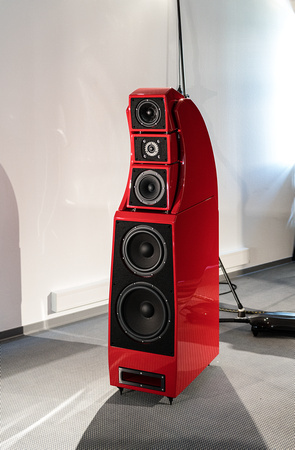 Von Schweikert Audio showed its $295k Ultra 11 thirteen-driver flagship (two 15” powered subwoofers, four 9” ceramic mid/bass drivers, two 7” ceramic midranges, two beryllium tweeters, two 5” aluminum-ribbon super-tweeters), augmented with VSA’s Shockwave V12 subwoofers, and driven by the same VAC Statement electronics and sourced by the same Kronos Pro turntable VSA used at the Ultra 11’s debut at AXPONA Chicago. 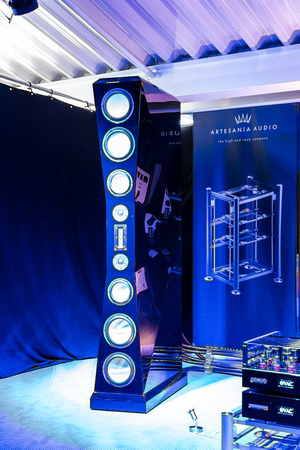 Though VSA seemed to feel it was only getting 75% of what it got in Chicago, I thought the sound was improved—much more transparent than at AXPONA, with gorgeous color and none of the midbass thickness and texture that bothered me in Chi-town. Really an amazing transformation. Delicacy, color, focus, sweetness, and soundstaging were first-rate. Indeed, the only demerit was the typical-for-MOC boom in the bass—and that wasn’t the Ultra 11’s fault. 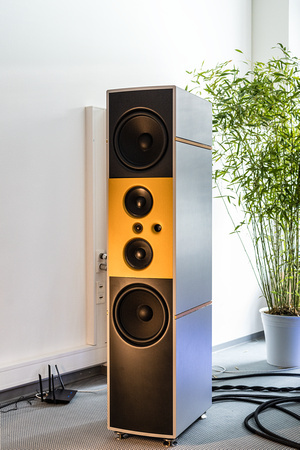 Switzerland’s Stenheim displayed its €184.5k Ultime, a four-way, eight-driver D’Appolito floorstander (four 32cm woofers, two 17cm midranges, one neodymium tweeter, and one ribbon supertweeter in a massive CNC-milled aluminum enclosure), powered by VTL electronics and sourced by Kuzma analog and Wadax Atlantis digital and wired with Fono Acustica cables. Despite a trace of the usual room boom (which darkened timbre some), the sound was beautiful—solid, spacious, and relaxed, with excellent imaging and staging, superb ambience retrieval, and no treble edge at all. 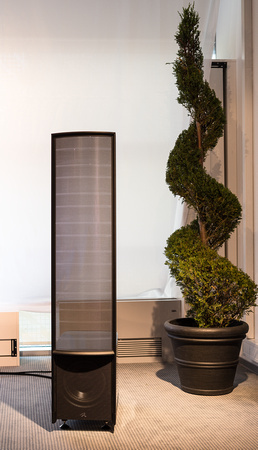 MartinLogan showed its ESL Expression 13A electrostatic/cone hybrid, driven by Pass Labs electronics. Though the 13A was not as full in color as the larger 15A that I liked so well in Chicago, from where I was sitting the blend of ’stat and cone was just as seamless, making the speaker sound very fast, deep-reaching—well controlled on Fender bass and kick drum, and very present and lifelike on voice. While the 13A didn’t have the greatest stage depth in the MOC room, I liked it. A lot. 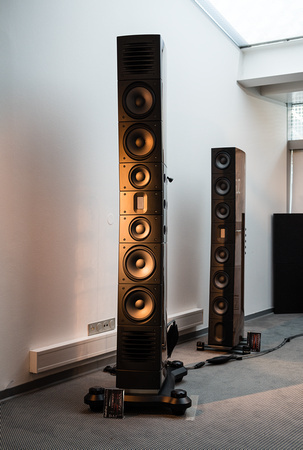 Richard Vandersteen demo’d his $19k Quattro CT, a four-way, five-driver floorstander (one 1” carbon-dome tweeter, one 4.5” midrange, one 6.5” mid/woof, and two 8” subwoofers), driven by Marconi electronics, and sourced by Bardo analog and Nyquist digital. The system sounded a mite darker than I'm used to from Vandies but still very beautiful on digital sources, with that wonderful midrange presence that Vandies have always had. Good solid bass, too. 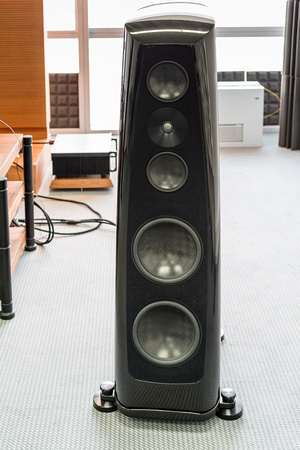 Vivid Audio showed its top-line $93k Giya G1 Spirit four-way, five-driver floorstander (one 26mm metal-dome tweeter, one 50mm metal-dome midrange, one 125mm alloy/carbon lower midrange, and two 225mm alloy woofers in the Giya’s distinctive exponentially tapered tube enclosure), driven by CH Precision electronics and sourced by a TechDAS turntable. On a Miles Davis LP from 1956, reproduction of trumpet was superb, with very good bass and an extremely spacious and airy soundstage, though the overall presentation was a bit analytical (a characteristic of CH Precision electronic). 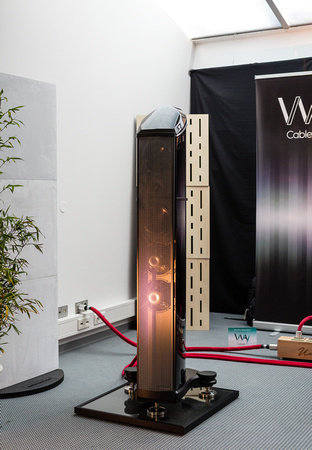 Piega displayed its $18k 511, a six-driver three-way (one coax ribbon midrange/tweet, two 160mm active mid/woofs, and two 160mm passive mid/woofs in an aluminum enclosure), driven by Primare electronics. The sound on “Omphale’s Spinning Wheel” was just delightful—full, robust, of a piece, and very fast in the midrange and treble thanks to Piega’s remarkable coincident ribbon driver. To keep you from dozing off, I’m going to condense the remainder of my report. 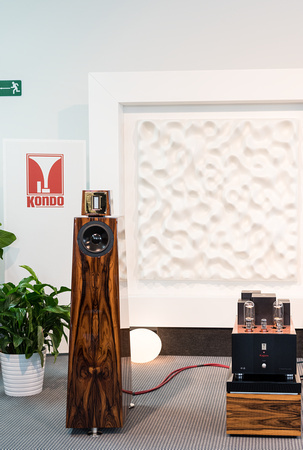 Goebel showed its €115k Epoque Fine with Vitus electronics, VPI ’table, and Purist cables. The speakers generated a sibilant lisp on Johnny Hartman’s voice. I could hear a problem on trumpet too—a bit of edge in the upper mids. 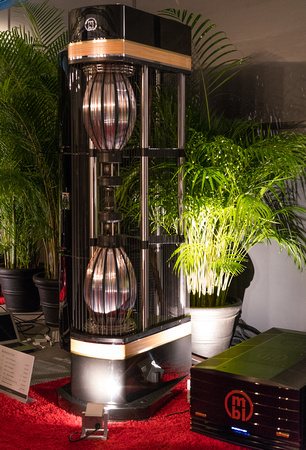 The Wilson Alexx was being shown with Nagra electronics, sourced by a Kronos ’table, and wired with Transparent Opus. Johnny Hartmann sounded much better and more natural here than in the Goebel room, with less lisp and and more chest, though the bass was less prominent and not quite as well controlled. A good sound. Just a tad brighter than I'm used to. 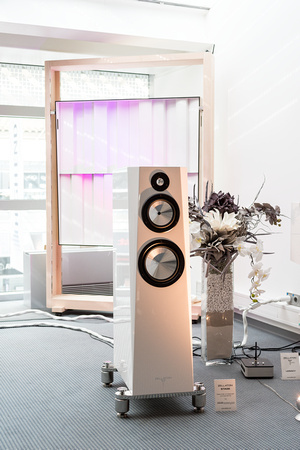 Lansche showed its €33.5k 5.2 three-way with plasma tweeter, paper mid, and aluminum woofer, driven by EMM Labs electronics and source. 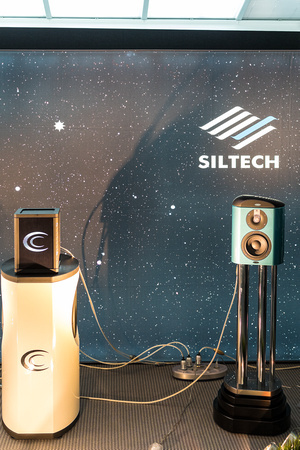 The presentation was quite lively with what sounded like a much faster woofer that mated very well with the plasma tweeter. 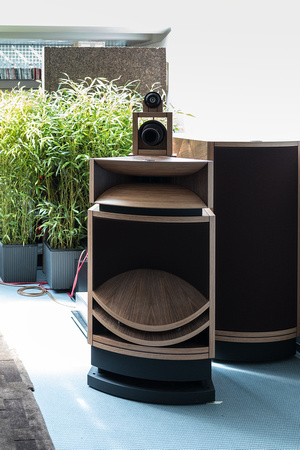 Einstein showed the €45k The Pure three-way, three-driver floorstander (one active powered woofer, one midrange without crossover, one Alnico horn tweeter), driven by Einstein electronics, and sourced by a TecDas ’table. The sound was simultaneously a bit dark and bright and aggressive. 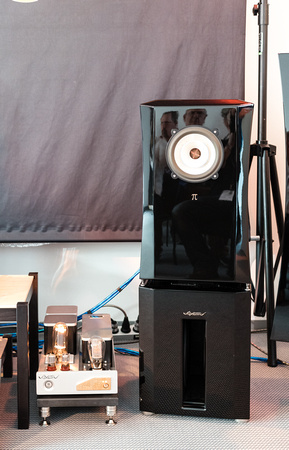 The new €100k Marten Coltrane III driven by Engstrom electronics was a bit on the thin light side, despite the tube amplification—very hard-hitting and fast, with superb definition, color, and speed on electric bass but a little too much tweet. 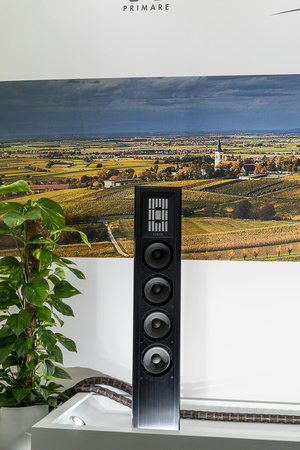 Gauder Akustik Berlina RC8 driven by AVM was fast, present, pacey, and exciting with superb resolution and speed top-to-bottom. 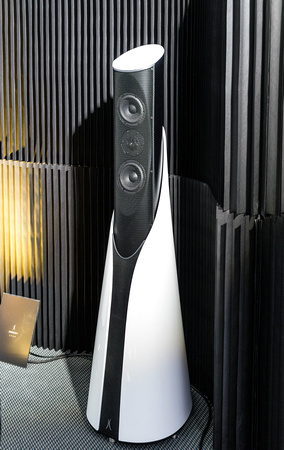 The speaker had a planar-like presentation, but with exceptional grip, definition, and extension in the bass. Just a first-rate German sound, which is to say very neutral and controlled and of a piece, albeit a mite lean. 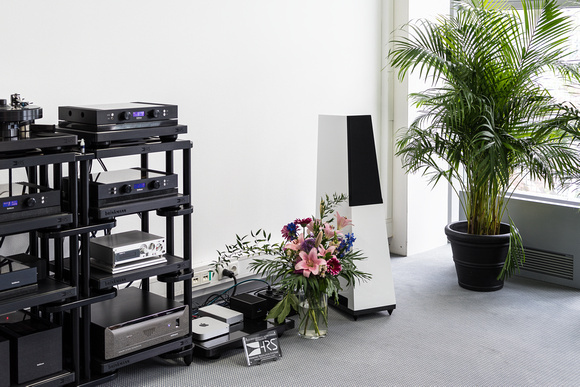 Vienna Acoustics’ €6.5k four-driver three-way Beethoven Baby Grand sounded natural, full, and lovely on digital driven by Vincent tube gear. Wilson Alexx driven by Moon by Simaudio electronics and hooked up with MIT was a disappointment—too bright on piano and with a big boom on bass fiddle. 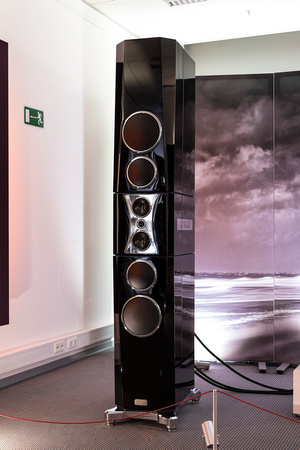 So, alas, was the ultra-expensive Tidal La Assoluta driven by Tidal’s own electronics. 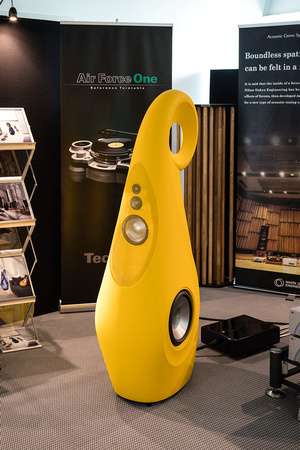 This huge, gorgeous-looking speaker was ill defined in the bass, slightly bright in the upper octaves, and lacking the liquidity that makes Tidal so special. 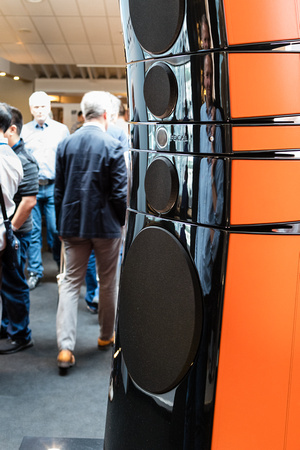 Estelon intro'd the €50k Lynx claimed to be the first high-end wireless loudspeaker. Unfortunately the Lynx was on passive display, so I can't confirm the claim. I also can’t report on the Magico S3 Mk II driven by Spectral, as the room was so crowded that I couldn’t get a seat (on three separate occasions). Given the crowds, I imagine the sound was excellent. 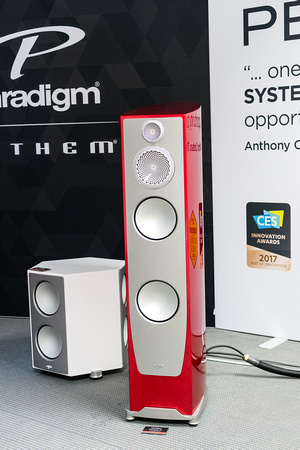 Elsewhere, Focal intro'd a new version of its flagship, the Utopia III, on passive display only.